Oils are one of the most widely used ingredients in cooking – you can find them in every cooking method, including sauteeing, pan frying, roasting, and even dressing raw foods. Besides salt, using cooking oil or fat is essential to preparing meals. Shopping for the right cooking oil is easy. Olive and canola oil are both easy to find and healthy choices when used in moderation, but let’s take a closer look at the components of different oils and how they could potentially affect your health. The fast-food industry uses frying oils that contain trans-fat and it’s unlikely that you’ll find this sort of oil for sale in your local grocery store. When in doubt, look at the ingredient list. If it contains any trans-fat at all, even in the form of “partially hydrogenated” oil then it’s a definite pass since trans-fat accelerates plaque build-up in your arteries that eventually causes coronary heart disease and should be completely eliminated from your diet. How much saturated fat does your cooking oil contain? I always look at the label, but one oil that is particularly high in saturated fat – coconut oil – does come to mind. It’s about 12 grams of saturated fat per tablespoon -that’s a lot when nutritionists say to stay well under 20 grams total of saturated fat a day, depending on the state of your health. Canola oil has 1 gram of saturated fat per tablespoon and olive has 2 grams. Studies have shown that saturated fat raises blood cholesterol, while mono- and polyunsaturated ones do not adversely affect cholesterol. There are several conflicting studies and views about coconut oil and whether it’s problematic for heart health. Most health experts now say that it’s fine in small amounts, however avoid the “partially hydrogenated” version which you won’t find in oil form but is ever-present in processed baked goods like cookies and cakes as well as in cereals and crackers. You’ve probably heard both these terms quite a bit in the news – especially when it come to heart health. So we know that both are great to protect your heart, help cell growth, and help your body to create a healthy immune system. But most Americans are not getting enough of either – probably only about 10% of what they need. And when it comes to omega-3’s, most people have a lopsided ratio with omega-6’s: in the Western world, most populations get 15-40 times the amount of omega-6’s compared to omega-3’s, because their diets are relying on corn- based products, including corn-fed beef that are used heavily in fast foods, processed foods, and processed drinks like soda and sports drinks. So choosing oils like olive, canola, or flax seed oil are your best choices since they contain omega-3’s and other vital nutrients that you’ll see listed in the oils below. So now you know how to stock your pantry with healthier oils, but remember: just because it’s low in saturated fat and has no trans-fat, it still contains other types of fat. 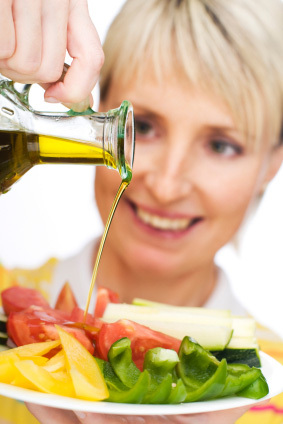 All cooking oils, including olive, canola, and corn contain 14 grams of total fat per tablespoon and 120 calories. So get out the measuring spoons and be aware that most 2000 calorie-a-day diets limit total fat to around 65 grams a day. 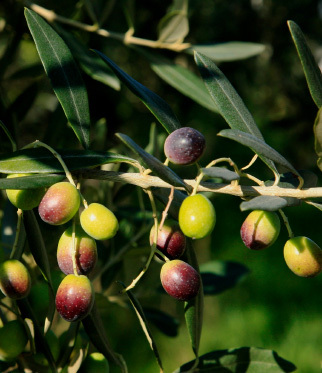 Olive Oil – Nothing can beat the fruity, rich taste of extra virgin olive oil that comes from the first cold press of the fruit of the olive tree. While olive oil can be costly, remember that a little bit goes a long way. “Light” olive oils come processed, such as filtering and refining, and is lighter in flavor which makes it great for international dishes and baking. Canola Oil has recently become very popular due to its low saturated fat content and high smoking point. Derived from the rapeseed, it’s called Canola and not Rapeseed oil because Canola stands for Canadian Oil Low Acid: The rapeseed’s indigenous to Canada and it has a low acid content. Used as a lamp lighter hundreds of years ago and then discovered for its culinary uses. High in Omega-3s as well. Sesame Oil – There are 2 types of sesame oil: One that is made from roasted seeds and the other one made from unroasted seeds. The roasted sesame oil has a much more robust flavor and is commonly used when preparing many asian dishes. They make wonderful salad dressings and can be mixed with canola for delightful stir-fry recipes. Avocado Oil is pressed from the flesh of the avocado fruit, and if you love avocado, you’ll love the oil. It has a high smoke point so you can use it as you would canola oil. High in mono-unsaturated fats and contains some vitamin E.
Walnut and Hazelnut Oil – Both are made from the pressed nut and retains its nutty, strong flavor. They are used mostly in dressings and as a seasoning since they can be costly and sometimes bitter if overheated. Great for drizzling on steamed and grilled veggies like broccoli, asparagus and carrots topped with fresh herbs with a light sprinkle of toasted nuts. Sunflower oil is pressed from the seeds of the sunflower plant. High in polyunsaturated fats, it has a neutral flavor that makes it very versatile. It’s used primarily as frying oil for pan-cooking anything from breaded zucchini to chicken cutlets. Safflower oil is pressed from the seed of the safflower plant that grows in warmer climates. The flower has a thistle- like global flower head that was used by the ancient Egyptians as a fabric dye. It has a similar make-up to Sunflower oil and is prized in ayurvedic cuisines, but also used in margarine production. Store all oils away from direct sunlight and heat, inside a cool cabinet is ideal. Check out the use-by date as oils do expire and tend to smell a little sour when they turn rancid. Typically the more fragrant the oil, the shorter the shelf life. I store my “gourmet” oils, like hazelnut or walnut in the fridge to protect them from getting rancid since I don’t use them as often as canola and olive oil. Read more about the coconut oil controversy. Find out how to balance health fats and carbohydrates in your diet. Learn more about storing olive oil.